I saw this video trending on Youtube and had to share it with you guys. In a great two part video by the theslowmoguys and smartereveryday, we get to see some amazing and unexpected things happen when a gun is fired underwater. Not only is this awesome to watch but there’s a lot of really cool science going on here. The first video really focuses on the high speed footage while the second part explains the science in a little more detail, so it’s well worth watching both parts. Both of these channels are on my subscribe list for sure and I’m sure you’ve seen videos from one of these channels before as well, but in the odd chance you haven’t, you can get your geek fix and check out some of their most popular videos. Anyone remember Duke Nukem Forever? It was in development for over a decade and it looked like it might never happen until Gearbox came along and wanted to acquire the rights to the game. Once they took over in 2009 they eventually released the title in 2011 to mediocre reviews. 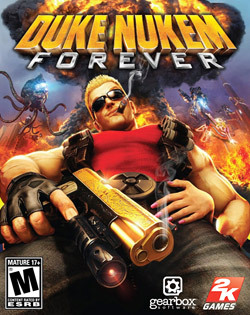 Although it did capture some of the greatness of Duke Nukem as a character, there was much to be desired and the game still didn’t feel complete. Fast forward to today and things are heating up between the two companies as 3D Realms is now suing Gearbox for $2 million claiming that they are withholding owed royalties. Gearbox’s VP of Marketing, Steve Gibson, responded to a request for further details from Joystiq with the following statement. It looks like there are fuzzy details surrounding this lawsuit and it’s probably in the best interest of both companies to get this situation cleaned up and unfortunately that means heading to court. This lawsuit was originally discovered by Duke4.net, where they have an image of the filing. The next installment of Call of Duty, Call of Duty Ghosts, is officially coming and it’s also going to be on next-gen hardware like the Playstation 4 and Xbox (Infinity?). The new COD is also set to be released on the PC. I have tried to find information confirming the release of Ghost on the Wii U but I haven’t come up with anything as of right now. The teaser trailer provides essentially no information about the new game but it’s enough to leave us in anticipation for more. Luckily, we will be getting more details at the Xbox reveal which is set to go down on May 21st at 10:00 am PDT on Xbox Live, Xbox.com and Spike TV. Call of Duty: Ghosts will release on Xbox 360® video game and entertainment system from Microsoft, PlayStation®3 computer entertainment system and PC on November 5.